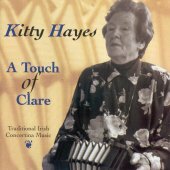 Kitty Hayes is a concertina player from West Clare, and her CD, the latest from that great Clare-based label Clachan, is an absolute gem, perhaps the best they have produced so far. Recorded informally in an Ennis kitchen with great natural acoustics, Mrs. Hayes plays in a simple and direct manner, beautifully complemented at times by the concertina of Dympna O'Sullivan, the fiddle of Yvonne Casey (Ceili Bandits), and the bouzouki of Eoin O'Neill. Highly recommended.